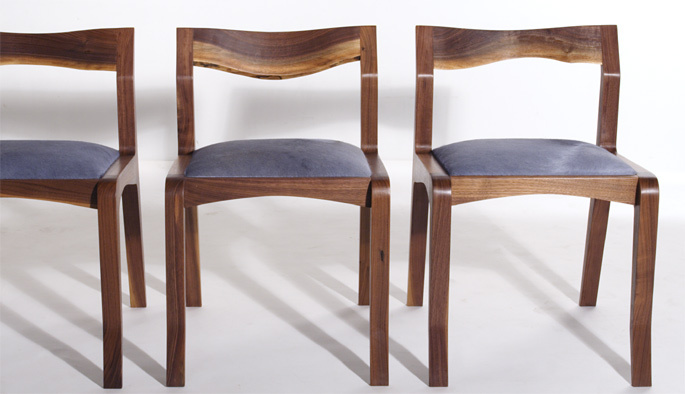 Eric Manigian Studio’s Ruskin Chairs. 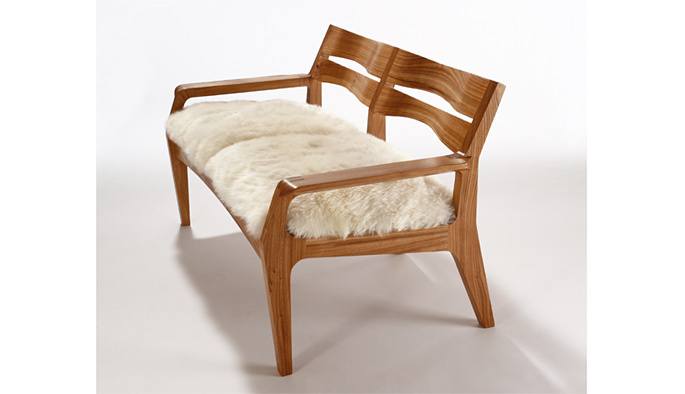 Whether it’s Austin or Seattle, Brooklyn or Portland, there has been a resurgence in furniture-making in this country. Even the mail-order and retail chain Room & Board is showcasing American-made furniture in all its high-quality goodness. The development is welcoming and refreshing, but it remains to be seen if this is a mini-trend or a movement. This week, HomeIQ is doing posts on all things furniture–foreign and domestic–including profiles on U.S. firms helping to fuel the charge and cutting-edge modern work from European designers. First up is Brooklyn, N.Y.-based Eric Manigian Studio. 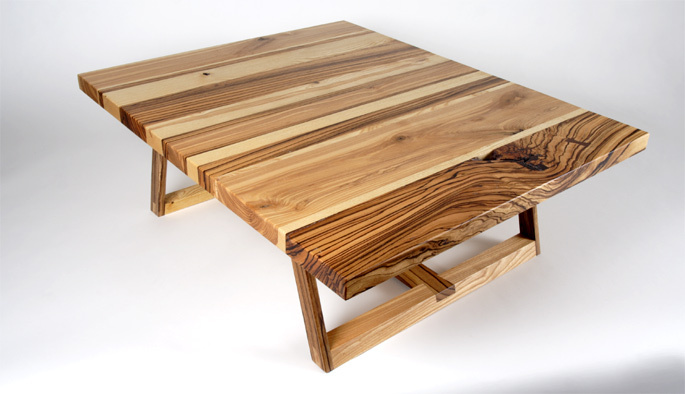 The artist/furniture-maker describes his company as fusing “clean minimalist design with hand craftsmanship to create custom furniture of uncommon character and simplicity of form.” The studio primarily uses hand-selected wood from fallen, diseased, or discarded trees to fabricate its furniture, incorporating high-quality techniques such as dovetail and mortise-and-tenon joinery. A graduate of the Pratt Institute in New York, Manigian’s work can be found in places such as Morgan Stanley, Frederic Fekkai Salon at Henri Bendel, N.Y., and Calvin Klein. Manigian recently answered some questions for us. 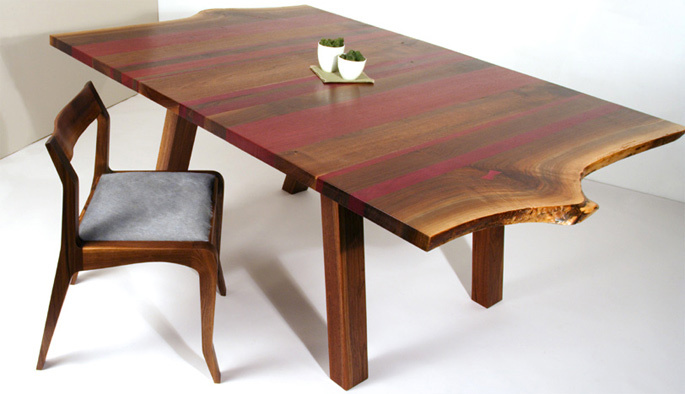 Editor: With so many young woodworkers springing up, is the U.S. going through a renaissance of sorts for handmade wood furniture? EM: It could be, but if the culture isn’t there to support it, it will die again. There has to be people who understand and appreciate what’s really going on and be willing to affix, not only the right monetary value, but social value as well. Understanding what really motivates the true craftsman, we would naturally hold them with respect. 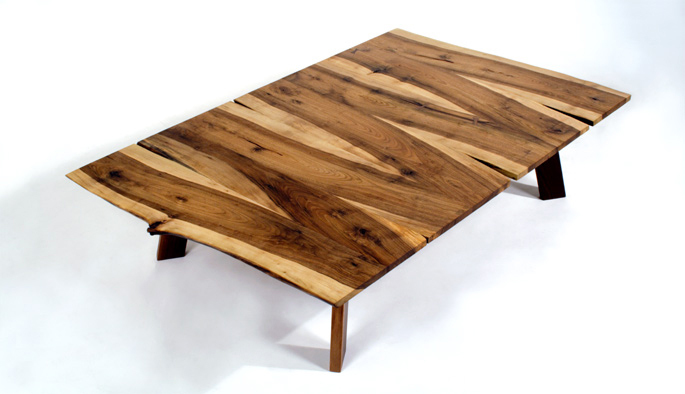 Editor: Have you notice an increase in interest in wood furniture? apprenticeship positions and I’m encouraged that there has been an increase from architecture students and I just finished with two recently graduated students from Pratt that give me hope for a new generation of architects that will be more connected to their bodies and to the intimacy of experiencing materials and how things are connected. Editor: How long has your studio been open? Late 1998, early 1999. I left the art world in desperate search for something more grounded and sincere. Editor: How did you get your start? After receiving a BFA in sculpture from Pratt Institute, the artist/teacher Max Gimblett introduced me to Zen ideas. When I graduated I travelled around Asia and stayed in Kyoto for a year studying Zen Buddhism. The temple architecture and wood craftsmanship knocked my tabi (Japanese socks) off. When I returned I looked up an old sculpture teacher who was originally from Japan and a traditionally trained carpenter. He taught me about the tools but more importantly, the proper mental perspective in addressing the material, tools and practice. His name is Toshio Odate and he still has an important role in my life and practice. Later I was prompted by working with Dennis Crompton from the British architecture collective “Archigram,” and I started to pursue a Masters in Architecture but decided I had already found my path in design so didn’t continue. I’m still investigating architectural design but from my own process and incorporating wood and traditional joinery methods. Editor: How would you describe your work? 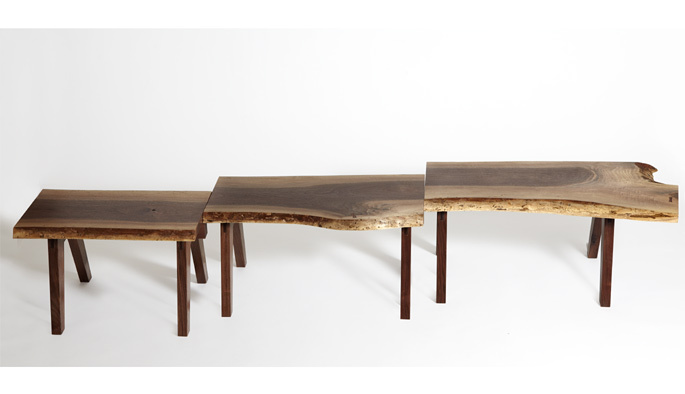 Contemporary wood furniture, designed with respect to the tree. Rooted in the tradition of craftsmanship, designed for the context of 21st century architecture. Editor: How do you work? If you start from the perspective that each piece is like saying a prayer for the tree, then you are obliged to make something of lasting quality. Once you have a multi-generational view your designs naturally become less trendy, less superficial, less gimmicky, less of a spectacle screaming for attention and you start to look for the more quiet, subtle elements within the piece to investigate. A design often shows itself within this process. It’s the “shut-up and listen” method that my first Zen teacher in Japan tried to show me. Editor: What types of species do you work with? I’m primarily using domestic hardwoods salvaged from the wood chipper or landfill by a couple of small millers who cut and dry the tree in a specific way. Mostly Walnut, but I incorporate a couple of imported woods for the Bandwidth series. I’ve also used Elm on some pieces recently and it’s beautiful too. Editor: What has become your trademark? Not sure if I have one, and hope my work doesn’t become too static to label too easily. Editor: Do you specialize in anything? quality and sensuality. A pioneer in this cultural shift is someone like Alice Waters who created Chez Panisse and started the Slow Foods movement in the US. I see a new interest in artisanal breads, hand-made clothes and crafted beer. It certainly changed coffee in this country and we will never go back. So I remain optimistic and motivated. Editor: What’s your most popular piece? The “Bandwidth” series and the “Fold” series have been collected by some important corporations like Calvin Klein, Morgan Stanley, The McKinsey Corp., and Warren Buffett’s NoVo Foundation, but I’m excited by a couple of new design directions that I’m working on that I hope people will like. To be released in the fall if I have a productive summer. But you’ll have to stay tuned! Congratulations Eric on a well deserved spotlight for your exquisite furniture. I pray that the appreciation for craftsmanship and integrity of design will continue to flourish in the 21st century. Eric, you are riding the wave. I can see your practice in these pieces. I will share this with my dtr and son in law, he is a fine furniture artisan like yourself but just starting out in the Portland OR area. All the best.